LEGO IDEAS - Blog - LEGO Ideas: Transition fun facts, and responses to your questions! 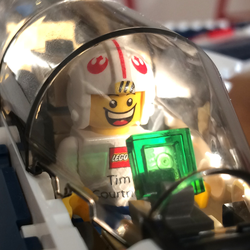 LEGO Ideas: Transition fun facts, and responses to your questions! Thank you all for a great first week on LEGO Ideas! Our team is busy catching up on approving new projects, and we’re working on small fixes and improvements uncovered since launch. …and 174,559 Friendships :-) (when people follow one another). WOW! LEGO Ideas is built using responsive design and re-formats when you are on a desktop, tablet or mobile phone. You can submit projects from a desktop or tablet, but not from a smartphone, as our experience has shown projects submitted on smartphones are of much lower quality (spelling, grammar, punctuation, etc). If you experience any issues with the site (for example challenges on different devices), please send a description of what you experience along with as much information as you have (screenshots, operating system, browser, device, and version information) to us at support.ideas@LEGO.com, and we’ll forward this to our development team to investigate. Video links now appear embedded automatically when you include a YouTube video URL into your project. We feel this adds to project pages since many of you like to create video promo reels of your projects. Just remember that the videos must comply with our Project Guidelines and House Rules for your project to be approved. Some projects that were migrated from LEGO CUUSOO included hyperlinks to videos in the middle of a sentence, and those have unfortunately generated some formatting issues. If that has happened to your project, please write us at support.ideas@LEGO.com and our team will clean up the video placement in your project as we’re able. Projects are now given one year to reach 10,000 supporters in order to create urgency, enthusiasm, and raise the bar to be considered as a potential LEGO product. The LEGO Review Board creates a business case for each project in Review. We’ve set the one-year benchmark to show there is sufficient demand to invest (time, money, people resources, and market priority) in producing a LEGO product. As a project creator, we encourage you and your fans to get out there and promote your project so it reaches 10,000 supporters within a year. Projects can no longer be edited, only updated. On LEGO CUUSOO, you could edit your project as much as you like. Some members went so far as to change their projects entirely, all while keeping their supporters. This made the project’s original supporters unhappy, and made it impossible for us to determine exactly what the supporters counted toward. Going forward, you can no longer edit your project, as it is a proposal for a potential LEGO product, and we must ensure the concept you are asking people to support doesn’t change its nature throughout the process. Therfore we encourage you to take time and submit your very best images, and thoroughly proofread and edit your project before submitting. For former LEGO CUUSOO members we know this will take some time to get used to, but if you want to improve upon or refine your work, please do so in the Updates tab. Note: If you have projects brought over from LEGO CUUSOO with formatting issues, such as awkwardly-placed embedded videos or outdated mentions of “LEGO CUUSOO” you may contact us to make very limited edits, at our team’s sole discretion, as priority allows: support.ideas@LEGO.com. We will not edit new projects on your behalf. Clutch Power (which includes both your points and badges) is awarded going forward. Since Clutch Power is new to LEGO Ideas, your past activities on LEGO CUUSOO don’t count toward your Clutch Power - unless your project reached 1k, 5k, or 10k supporters of course, as that’s a really big deal. Our team will add these badges to project owners’ profiles in the coming weeks. Both our community and development teams are already improving LEGO Ideas based on your input. We’ve noted your other questions and concerns not addressed here, and we’ll respond as the need and priority allows. Launching LEGO Ideas as a complete LEGO brand experience is the LEGO Group’s commitment to innovating on products with you, and we’re looking forward to where we go together. If you have any feedback or challenges, please write us at support.ideas@LEGO.com.